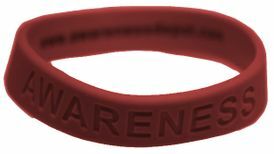 Burgundy "Awareness" Bracelet for Multiple Myeloma are our most popular seller. Thousands in stock. Will ship today. As low as 99 cents ea. They are standard 8" adult size bracelets. These rubber bracelets are debossed with the word "AWARENESS" on them. We have many styles in stock and thousands of them. So if you need them fast, we have them and cheap. Great for fundraisers! Burgundy for multiple myeloma Awareness. Click on the picture for volume discounts. If you'd like a custom bracelet, please click on the custom bracelet button.